Step back to the mid 1400’s before printing was developed and ask yourself if you had never read a book, would you be able to understand spelling? Likely, you could spell phonetically but dialect might make your word completely different from words written by others. Complicate the spelling issues with a complex alphabet and multiple words with the same meaning and then try to write something that will last through many centuries as an important work. Through the Medieval Period, there were many writers, each handicapped by the situations outlined above. Here is an example of Early Middle English, an excerpt from The Paston Family Letters written in 1465. “Tho my wele be-louyd son John Paston be þis delyuered in haste. With effort, we can read this passage. One thing that makes it so very difficult is the combination of letters into a single character. 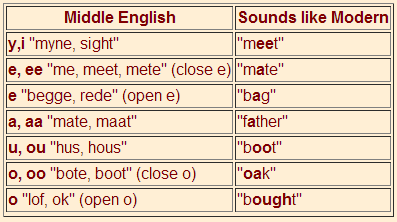 For example, þ is the character for the th sound and the 3 was used in place of the y sound. The introduction of printed documents advanced the standardization of spelling but at the same time, pronunciation was evolving with vowels taking on new values. Early Middle English began to fade as Modern English pressed onto newly printed pages of legal decrees and documents of the court. Geoffrey Chaucer is known as “The Father of English Literature.” Not only did he write the first realistic work of fiction, he wrote in Middle English, the language of the common people rather than in Latin, which was the language of scholars or in the language of the court, French. He created works accessible to all people, not the elite few. He is known as the first great master of laughter and tears. He captured emotion and infused his poetry with irony and satire. Although Chaucer (c. 1340 – 1400) is best known as a poet, his other life experiences cannot be ignored as those experiences had a major impact on his poetry. He was born in London, England into a social middle class family, descendants of the affluent London wine trade. Official records of the Medieval Period are scarce, making much of Chaucer’s biography an educated guess rather than fact. It is believed that Chaucer learned to read before attending St. Paul’s Cathedral School, a benefit of living an advantaged life. In 1357, Chaucer became a public servant to Countess Elizabeth of Ulster, for which he was paid a small salary, barely enough to keep him fed and clothed. Two years later, he left to fight in The Hundred Years’ War, was captured and held for ransom. Due to Chaucer’s pre-war connections, King Edward III helped obtain his freedom. 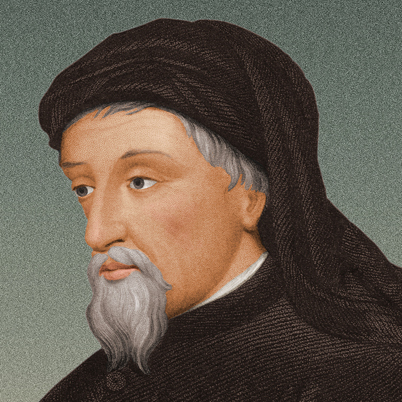 Chaucer continued to work for the Royal Service as a diplomat into the 1360’s. In 1366, Chaucer’s career with the English court when he conveniently married well, became an esquire to King Edward III, worked as a diplomat, Comptroller of Customs, Justice of the Peace and a member of Parliament. Chaucer’s duties as a public servant left him with little time to spend with his writing. Although he was not producing much poetry during these years, he never abandoned his creative bend. His major works include the Parlement of Foules, an allegorical poem peppered with irony and satire that addresses the farce of courtly love. In his narrative poem Troilus and Criseyde, Chaucer retold a tragic love story and introduced his Rime Royal, a form of rhyming stanzas containing seven lines each in iambic pentameter. Chaucer is perhaps best known for The Canterbury Tales, a creative venture in which Chaucer created thirty characters to travel to and from Canterbury and shared stories to pass the time. The characters came with diverse experiences and status within society. The primary concept of The Canterbury Tales was truly complex as he created a “frame story” or many stories housed within the main story. Chaucer originally wanted to write four tales for each character, two for the journey to Canterbury and two tales for each return, a total of 120 stories. Unfortunately, only 24 tales were written and the story ends without any of the main characters reaching Canterbury. It is possible that Chaucer decided to revamp his plan, edit and possibly restructure the tales into a smaller project or more likely, The Canterbury Tales were left incomplete at his death on October 25, 1400. Geoffrey Chaucer was the first poet to be laid to rest in the Poets’ Corner of Westminster Abbey. Contrary to what this honor implies, his interment in the Poets’ Corner was not based on his gift with the craft, rather his elite resting place was an offering of respect for his previous work for governing nobility. By writing in his vernacular English instead of Latin or French, Geoffrey Chaucer created a major literary shift by presenting works accessible to all classes, without the pretensions of scholars or royalty. He used simple, straight-forward language (for the era) and created major works that support his standing as the Father of Modern English. Chaucer’s down-to-earth approach ushered the literary world from the Medieval into the Renaissance Period. Thank you for joining me for a quick and simplistic look at the Medieval Literary Period. You can pack away your tunics and leggings. Next month, we venture into the Renaissance with elaborate colored robes, gowns, ruffled collars and wigs. I’m pleased that the trend of men’s tights and ballooned pantaloons faded away to history. wow…never heard about him before…so very interesting beth…and it’s hard to imagine how life was without the books and tools we have now available…incl. spell check.. and also cool to learn that Westminster Abbey has a poets’ corner.. need to pay Chaucer a visit when i’m in london next time.. If we all did that, we would have some very interesting profile pictures. Did you know that most of the wigs that nobility wore were crafted of hair from peasants? I would probably be one of the shorn ones in the Renaissance period rather than the nobility. I have very fond memories of studying Chaucer in Middle English during the first year of my bachelor’s. Unfortunately, I’ve lost the knack for reading it in the original. But even 600-plus years later, Chaucer’s wit and mastery was clear to me. He had a knack for irony and satire. Reading Middle English actually gave me a headache when I tried recently. My brain wasn’t making the translations easily. Thanks so much. Hadn’t really thought about such literary challenges. Makes one wonder how the Bible came into being. Such a thought provoking history. Thank you, Beth. I wonder how many translations the Bible has gone through to reach the readability of modern day. Excellent point. King James Bible–was this the first not in Latin? Shakespeare’s English throughout as that was its time. Chaucer sounds like a pretty busy man! Oh, I do agree. I like to read poetry where I can relate to the words. I’ll tell you a secret. If I have to look up more than two words in a poem, I stop reading. I figure it wasn’t written for me to enjoy. ha. i hear you. if i have to work that hard…i’d take a college course just to listen to professors try to impress me…smiles. One of the ironies there is that some poets use words that were common in an older era to give their poem an illusion of literary depth but taking their poem in an elitist direction rather than in a popular direction. Perhaps that is the reasoning but the overuse of obscure words, in my opinion, leads a pretentious air rather than the respect for literary skills. Never could get too far into Canterbury Tales, must confess. I liked your post but will, most likely, leave it at that. Retold, however, some of the tales are quite fun. Chaucer has been on my to-do list: partially from a linguistic perspective and partially from a historical perspective. But after your fine essay Beth, I am thinking of doing a comparative venture between his Tales of Canterbury and the Hindu Panchatantra (200s BCE), which has a similar complexly interwoven substructure of sorts. But of late, I am busy and only have time for short reads like this to keep my literary brain feed. Thanx Beth — a fantastic inspiring post. BTW, Beth, do you know of any annotated modern translations with explanations of allusions, vocabulary and history. Or good side-by-side paraphrased-translations? Also, thinking about it, you’d be the far better person to write on the Panchatantra — have you read it? I love to see your literary mind dig into that and present it to us. There are some good side-by-side translations available. I will get the link and be back to share. Since there is no way to follow comments on this blog, Beth, please e-mail me (gmail and preceded by my one-word-name) and let me know if you do anything on the Panchatantra! I’m glad he simplified the English language. I can’t even make out most of the first part . Thanks, Beth. History is enlightening. Oh, thank you so much! I dearly love Chaucer. I think he is Shakespeare’s only real rival, not only for his brilliant writing but also in the breadth of his understanding of human nature. I have visited his resting place in Westminster Abbey. that had to be a pretty cool experience…. I was fascinated by Westminster Abbey when I was in London and the Poets’ Corner lingers in my memories. In Chaucer’s time (1300s), due to those language issues, I may not have written. And I can’t paint and with my luck, I’d be jumped, robbed and killed traveling through the forests. Instead, perhaps like William of Occam (1350? ), I would have explored Nominalism (to help rid the world of deceptive abstract Platonic ideals and universals) or perhaps teamed up in sharpening Occam’s razor. Or worked with Nicole Oresme (1360?) critiqued astrology and attacked the silly Aristotelian notion of humours in human physiology and help extricate the pervasive Church-sanctified mistakes of ancient Greek mistakes. Like all these thinkers, I’d have probably have been in the Church however — the only place to receive an education even if hiding one’s skepticism so as to pursue real knowledge. Thank you for this Beth. The Canterbury Tales our most important piece of English Literature is fascinating as a peep hole into the social mores of the times. The English were a very raunchy lot and verse like ” The Millers Tale” is bawdy and hilarious which today would be unacceptable. If I can find it I will put the relevant section up (in translation) .